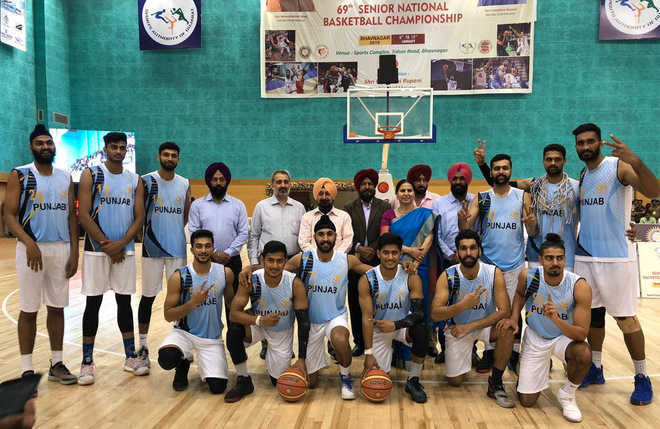 Punjab overpowered their spirited opponents Services in the men’s section in the 69th edition of the Senior National Basketball Championship that concluded at Bhavnagar in Gujarat on Saturday. Punjab cagers recorded victories in six matches out of seven they played and in the final Punjab men faced a tough resistance from their rivals before coming out triumphant (74-65) to lay their hands on the winner’s trophy. This was the 11th title for Punjab men in the national championship, while for Services, the title eluded for the second consecutive year, as they lost to Tamil Nadu (86-94) in the final in the previous edition of the event at Chennai. International star Amritpal Singh, who played a pivotal role in Punjab men teams’ title win, was declared the best player of the championship. He was awarded a cash prize of Rs 25,000 besides a trophy. Meanwhile, Punjab women gave a fine performance in this championship though they could not finish among the first three position holders. They played 11 matches, won nine and lost two. The eves improved upon their standing in points table, securing seventh position against the ninth in the 68th edition of the championship. Rana Gurmit Singh Sodhi, Punjab Minister for Sports and Youth Affairs, congratulated the players and their coaches on this achievement. Rajdeep Singh Singh, former DGP, Punjab, and president of the Punjab Basketball Association (PBA), Teja Singh Dhaliwal, general secretary of the association, Yurinder Singh Hayer, Mukhwinder Singh Bhullar, senior vice-president and vice-president, respectively, PBA, and Vijay Chopra also lauded the team members on this outstanding achievement.